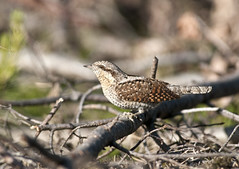 The wryneck (Jynx torquilla) is a species in the woodpecker family. This species mainly breeds in temperate regions of Europe and Asia. Most populations are migratory, wintering in tropical Africa and in southern Asia from Iran to the Indian Subcontinent, but some are resident in northwestern Africa. It is a bird of open countryside, woodland and orchards. The Coastal Archipelago Park of the South Coast ("Sørlandet") of Norway covers an area of the Skagerak coast between Grenland in Telemark and Lindesnes in West Agder, including many hundreds of islands and skerries. The Sørland coast is one of the most important recreation areas of Norway and hosts a unique coastal ecosystem with special habitats and a rich biodiversity. Therefore tourism is regulated accordingly with special nature reserves and bird sanctuaries in place. Presently discussed are plans to develop the so called "Raet National Park", outside of Arendal, Grimstad and Tvedestrand and the islands Tromøy and Hisøy.